Continuing the trend of bumper partner promotions by law firms this year, Trowers & Hamlins has made up more than double the number of lawyers it did in 2014 with nine joining the partnership, while Debevoise & Plimpton, which has missed London out in recent years, made up a third of its round in the City. Debevoise’ London office was the only outpost outside of New York to benefit from the round, with the promotion of investment management specialist Sally Gibson and litigator Richard Lawton to the firm’s partnership. Gibson primarily advises on regulatory issues facing private equity and fund management though has also been involved in restructuring work while Lawton has experience in a range of disputes matters including corporate litigation and investigations work stemming from corporate collapses and restructurings. In New York four lawyers made partner, with Scott Selinger and Jennifer Chu both promoted in the corporate department while executive compensation and employee benefits lawyer Meir Katz and Jim Pastore in the cyber security and data privacy practice completed the round. All six will become partners effective on 1 July 2015. Meanwhile, London was the largest recipient of Trowers’s promotions with two-thirds of those making partner doing so in the City while Manchester, Exeter, and Abu Dhabi were also bolstered by new partners. Real estate partners Katie Todd and Julian Keith both made the cut in the City and were joined by Youssef Boulos in corporate, public sector commercial specialist Lucy Doran, projects lawyer Stuart Wilson and litigator Theresa Mohammed. Outside of the city, real estate continued to be the focus with new partners Matthew Holbrook in Manchester and Rachel Carter in Exeter both part of that practice area. The firm made one international promotion with Johannes Eisser enhancing its corporate practice in Abu Dhabi. Eisser primarily works on M&A, foreign direct investment and joint ventures, and has experience in a range of sectors including telecoms, manufacturing, oil and gas, and retail. Last year, the firm promoted just four lawyers to its partnership with three of those based in the Middle East. Last month, Pinsent Masons announced a record 29 partner promotions, which took its total partnership to over 400, while Addleshaw Goddard doubled its round to 18. Debevoise & Plimpton co-head of arbitration David Rivkin has set himself up for a busy two years as the president of the International Bar Association (IBA), the largest legal network in the world with more than 40,000 members, as he seeks to win climate change sufferers refugee status, dent judicial corruption and protect legal independence from government hacking. Rivkin talks to Tom Moore on his plans for the body. In your presidential programme you listed tackling judicial corruption as a core goal for the IBA. How much clout does the organisation really have? Judicial corruption is a problem throughout the world and for civil society. The IBA can be very effective because any incident of judicial corruption involves lawyers, and as a global legal organisation of lawyers and bar associations, we can work to better understand the issues and implement solutions. I plan to strengthen our ties with the World Bank, the OECD, UNODC, and other organisations that focus on corruption and judicial integrity. What do you hope to achieve with your taskforce on Climate Change Justice? The IBA’s report contained many recommendations for the short, medium and long term. I asked our committees to focus on how to implement the recommendations within their expertise and we are forming working groups on legal remedies and adaption issues. For example, right now, those who are displaced by climate change are not considered refugees by international standards. If an island is flooded or if farmers can no longer farm their land, they must move. International law needs to change to recognise people displaced by climate change. They should be afforded the same rights under international law as those displaced because of war. But what responsibility do states have that have created the climate change? What rights do individuals affected by climate change have? These issues could be treated in a model statute on remedies or through an international court on the environment. How would this work and how realistic is it that countries would sign up? There’s no question it’s a difficult subject politically but we’ve seen more momentum this year towards recognising climate change and hopefully towards a meaningful treaty in Paris [at the United Nations Climate Change Conference in November]. We plan to work with various organisations to try to include human rights language in the Paris Treaty. We expect to have a draft of a model remedies statute by the time of the IBA annual meeting in September 2016 and states could then decide to enact it. An International Court on the Environment would require an international treaty. We are the first generation to understand climate change and we are the last generation to have the ability to do anything about it. What do you make of criticism surrounding TTIP and in particular, the clause that would send disputes to arbitration? My problem with opponents of TTIP is that many of the arguments are not based on facts. States don’t lose 99% of the time, in fact, they win the majority of time and even when they lose they usually only pay out a small percentage of the costs. The biggest criticism of investment treaty arbitration is that public interest is not considered, but it already has mechanisms to take into account public interest. The system has already moved towards strengthening that with the new transparency rules by UNCITRAL, and the revised ICSID rules permit more open proceedings so that NGOs have the ability to be involved. It’s important as governments consider TTIP that the public knows the facts. That’s a role neutral institutions like the IBA can provide. You’ve pledged to address challenges to the independence of the legal profession, including government and intelligence agencies breaking client privilege. How do you hope to do that? Some governments have sought to bring the regulation of lawyers under government control rather than respecting the independence of the profession. We have a task force to look at all of those issues. By understanding the common threads in those threats and understanding why governments have sought to take away the independence of the profession and not respect privacy, the IBA can do more to reduce such challenges in the future. There isn’t enough understanding among the general public of the role that lawyers play. Few other professions do as much in the public interest as lawyers. In order for us to serve the public and act as a check on government power, lawyers need to remain independent. 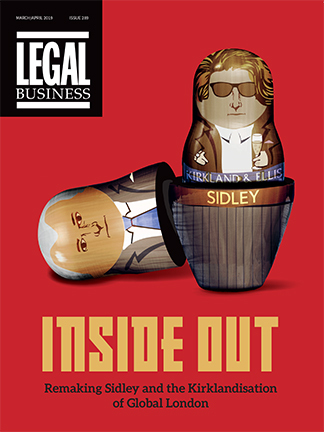 The IBA can do more to help the public understand the role lawyers’ play. The more they understand it, the less governments will be able to infringe on our independence. But do lawyers challenge governments enough? It’s rare to find a top City firm acting against a big bank or the government because of their own financial interests. Do you think lawyers need to do that more? The IBA and our Bar association members encourage others to take on the needs of clients wherever they may fall and to continue to respect the role of lawyers as a check on government. Our own experience at Debevoise is interesting, as for many years we have represented inmates at Guantanamo and have brought claims seeking their release. At the height of the Bush administration, one of their defense department officials wrote an op-ed criticising Debevoise and other law firms, for supposedly representing terrorists and specifically asked corporate clients of the firms whether they should support firms representing terrorists. That was an attempt to put pressure on us, but it had exactly the opposite effect. Our partners received dozens of phone calls from clients saying ‘congratulations, we’re glad you’re doing that’ and the official resigned because of that incident. What made you take up a role on President Obama’s National Finance Committee for the 2008 and 2012 presidential elections? I have always been interested in politics. In 2007, after having gone through a rough time in the Bush years, we really needed a president who could change our government, the way we interacted with the rest of the world and our respect for human rights, which the Bush administration had not respected. As soon as Obama announced his candidacy I got in touch with people on his campaign and I asked what I could do to help. I started raising money and was put on the national finance committee for that campaign and continued for the next one. The Hong Kong office of Debevoise & Plimpton has secured a heavyweight instruction advising Baring Private Equity Asia on the formation of Fund VI, a $4bn fund believed to be the largest private equity fund ever raised by an Asia-based manager and one of the largest targeting the region. Offshore firm Maples and Calder also provided Cayman Islands counsel on the deal. Baring, an independent PE house that advises funds with total committed capital of over $9bn, was advised by a multi-jurisdictional team from Debevoise including Hong Kong-based corporate partner and chair of the Asia PE practice Andrew Ostrognai, and international counsel Gavin Anderson. Other team members included New York-based partner Adele Karig, and Washington DC-based partners Satish Kini and Kenneth Berman. The PE giant is a longstanding client of Debevoise which has been advising on its fundraising activities for more than ten years, while the Hong Kong office also boasts Carlyle Group and AIF Capital on its client roster. Other major funds work for Maples and Calder, meanwhile, includes acting on the $3bn privatisation of Chinese online gaming group Giant Interactive, which was previously listed on the New York Stock Exchange, as well as its handling of Irish and regulatory aspects of the establishment of KKR’s $6bn second Asia buyout fund in 2013. Asia looks to be offering a healthy pipeline of funds related work for firms, as aggregate capital raised in 2014 totalled $55bn according to the Preqin’s 2015 Global Private Equity & Venture Capital Report, with $9.6bn raised by Asia-focused venture capital funds, 2.7 times more capital than 2013. On a global scale, last year’s league table by Bloomberg saw Weil Gotshal & Manges come out top for H1, ahead of Latham & Watkins in second and Simpson Thacher & Bartlett in third, while Magic Circle trio Freshfields Bruckhaus Deringer, Linklaters, and Clifford Chance all lost market share. Given the huge strategic weight being placed on the Asia network of Herbert Smith Freehills (HSF), the jewel in the international crown of the legacy City firm, the latest senior resignation to hit HSF will go down poorly. Debevoise & Plimpton today (7 November) announced that it has hired Mark Johnson, the well regarded managing partner of HSF’s Asia practice, to bolster its position in the region’s contentious market. The hire comes almost a year since the New York law firm hired high-billing litigation partner Tony Dymond from HSF in London. Johnson leaves HSF after 20 years as a partner at the legacy City firm, during which time he oversaw the opening of Herbert Smith’s disputes practices in Singapore, Jakarta, Bangkok, Beijing, Seoul, Shanghai and Tokyo. Johnson first moved to Hong Kong in 1987 and has built a successful practice advising on shareholder disputes, regulatory investigations and commercial litigation. He is well versed in dealing with the increasingly active Hong Kong Securities & Futures Commission, the Hong Kong Monetary Authority and the Hong Kong Stock Exchange. Johnson becomes Debevoise’s fourth partner in Hong Kong. Johnson is the 61st partner to leave HSF since July 2012, when the merger between Herbert Smith and Australian leader Freehills was voted through. The 450-partner global law firm saw a wave of departures in the wake of the merger, primarily from the legacy City firm, reflecting mixed views on the union but the pace of departures had slowed considerably. HSF is currently deciding between candidates to replace Jonathan Scott as senior partner in what will be a significant appointment for setting the firm’s post-merger direction and culture. The contest is now down to a two-horse race between City corporate partner James Palmer (pictured), often regarded as the firm’s top M&A lawyer, and Australian partner Mark Crean. The result is expected today with considerable pressure building for Palmer to secure the role given sensitivities that the legacy Australian firm is increasingly driving the post-merger firm at the expense of Herbert Smith partners. However, Crean did defeat Palmer earlier this year in an election to the firm’s partnership council. US firm Debevoise & Plimpton has announced that Tony Dymond, former co-head of Herbert Smith Freehills (HSF) Seoul office, will be joining its London office. Contentious construction expert Dymond (pictured) is the second high-profile HSF litigator to join Debevoise this year, with Kevin Lloyd joining the firm in July after resigning from HSF in December 2012. Like Lloyd, Dymond is a renowned litigator with 20 years of experience advising international clients on complex, multi-jurisdictional disputes. A solicitor-advocate, his practice focuses on high-value construction and engineering disputes in the energy and infrastructure sectors. Debevoise’s London office has seen significant expansion in its litigation practice, led by former Attorney General Lord Goldsmith QC. The team has grown by 12 lawyers in 2013 alone. ‘Tony Dymond’s arrival is great news for the firm. He is a highly respected lawyer with a truly international practice, and a key addition to our litigation team in London. Tony’s arrival also further demonstrates our commitment to provide premier English law advice to our clients,’ said Michael Blair, presiding partner of Debevoise. A HSF spokesperson confirmed that Doha-based dispute resolution lawyer James Doe has been promoted to partner in Seoul to replace Dymond, who ‘retired from the partnership’. HSF has had a difficult year following the merger between legacy Herbert Smith and Australian outfit Freehills in October 2012 with senior partner exits, particularly in its signature disputes practice, and a remuneration reform which took some time to get voted through. I’ve been really fortunate. I’ve had extraordinary opportunities in my career. I’ve had the opportunity not just as a hands-on lawyer, but also to do some politics, to take part in the affairs of the country… I’d like to think also that I’ve helped some people in a number of ways. There have been a lot of memorable cases. The Afghan warlord we got convicted at the Old Bailey. I suppose Caparo in the House of Lords – a huge case on auditors’ negligence. That was a tremendous result – we happened to get the result on the day of my wedding anniversary. That was quite nice. The favourite part of my job is being in court. It shouldn’t be but it is. I like being there, I like arguing, I like winning. It doesn’t always happen. I want to put on a good show, to do a good performance, and to solve the problem. I don’t like not solving legal problems. Debevoise & Plimpton and Davis Polk & Wardwell have landed roles on Verizon Communication’s record breaking $49bn US bond issue. The deal is bigger than the three previous record sized deals combined: Apple’s $17 billion deal in April, AbbVie’s US14.7 billion last November and Roche Holdings’ $13.5 billion transaction in 2009, according to Reuters, which also points out that the issue is larger than the GDP of 90 countries. Debevoise is advising Verizon, with a New York team led by corporate chair Jeffrey Rosen, corporate partners Michael Dis and Steven Slutzky working alongside tax partner Peter Furci. Davis Polk is advising the underwriters J.P. Morgan, Morgan Stanley, Barclays Bank, Merrill Lynch and Pierce, Fenner & Smith as joint lead arrangers and joint bookrunners. The Davis Polk team includes New York partner Jason Kyrwood together with Michael Mollerus and Harry Ballan. London partners Jonathan Cooklin, Will Pearce and Simon Witty are providing English law advice. The bond sale is being used by the US telecoms group to raise capital to finance the debt portion of its$130bn acquisition of Vodafone’s 45% acquisition of Verizon Wireless, an M&A deal which handed roles to UK firms Slaughter and May and Macfarlanes. The Macfarlanes team is being led by senior partner Charles Martin and corporate and M&A partner Graham Gibb and includes tax partner Ashley Greenbank. The team are working alongside Wachtell Lipton Rosen & Katz. Slaughter and May took the lead role for Vodafone led by corporate partner Roland Turnill, despite Linklaters being the company’s usual corporate adviser. The deal is one of the largest corporate deals in history.